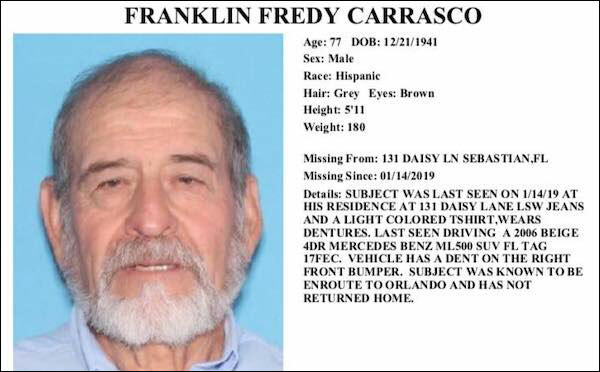 Franklin Fredy Carrasco, 77, was last seen at 131 Daisy Lane wearing jeans and a light colored t-shirt. UPDATE: Franklin Fredy Carrasco has been found safe. SEBASTIAN – Police need your help to locate a missing man from Sebastian who was last seen at his home on January 14th. He drives a 2006 beige 4-door Mercedes-Benz ML500 SUV with Florida tag 17FEC. The vehicle has a dent on the right front bumper. Carrasco was known to be on the way to Orlando and has not returned home. Anyone with information are encouraged to call the Sebastian Police Department at 772-589-5233, Det. Sgt. Wood ext 8587.